Inbox is our weekly round up of whisky news and PR material that has found its way in to our email inbox. It was created as we cannot write full articles or do justice to every piece that we receive. It features items from around the world of whisky and is published by us each Friday. A couple of weeks ago we were invited to the launch of The Scotch Malt Whisky Society's (or SMWS for future reference) new app at their London facility in Bleeding Heart Yard. In the past, an 'evening' at The SMWS (and their extensive collection of cask strength whiskies) has resulted in some 'less than productive' days at work the following day ... especially when Helen Stewart and Joe McGirr of The SMWS are present. This evening turned out to be no different and we joined them, plus some fellow whisky bloggers including Billy from Billy's Booze Blog, Jason from Whisky Squad and Mark & Michelle from Dramatic Whisky. Around this time each year, there is always a ripple of anticipation around the whisky industry as they wait to see what Diageo, the multi national drinks company, are to release in their annual Special Releases programme. This programme highlights some of the most exceptional single malt stock from within their portfolio of 28 working distilleries, plus remaining stocks from those which have been closed. Some of these stocks have dwindled to almost critical levels. The award winning Islay distillery has announced the forthcoming release of a new expression. 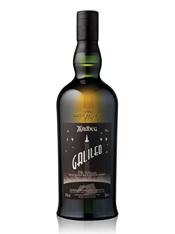 A new Ardbeg is always one of the most highly anticipated new releases in the 'whisky calendar' and the Galileo (named after the famous astronomer) is no different. As ever, it is expected to sell out very quickly, with some retailers reporting that their pre-ordered stock has already been allocated to customers. The whisky used in the Ardbeg Galileo was distilled in 1999 and it was bottled recently at 13 years of age. The final whisky is a mix of casks, combining first fill ex-bourbon casks with some ex-Marsala casks from Sicily. It has been bottled at 49% ABV, is non chill-filtered and will retail around the £70 mark. It should be available from September 1 in the UK, Europe and selected Asian markets. There will also be plenty of supporting activity for the launch on the Ardbeg website and a special Galileo Facebook page - keep any eye on these for further details. Our fellow London whisky bloggers and good friends Neil and Joel of CaskStrength have announced their second single malt release. Their aim is to work through the alphabet and release series of whiskies with one distillery from each letter. Roughly this time last year, they released a very limited Arran and now they have moved on to Benriach for the second bottling. They have selected a single cask which was distilled at Benriach in 1996 and was initially filled to an ex-bourbon hogshead. In 2008 it was transferred to an ex-Pedro Ximenez sherry cask and it has spent the last four year maturing in that. 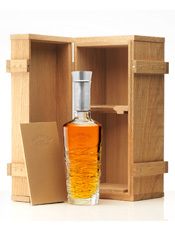 There are just 296 bottles and it has been bottled at the natural cask strength of 55.2% ABV. 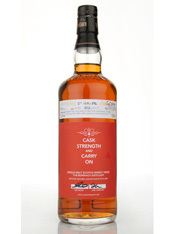 The bottling is being sold via online retailer Master of Malt for a price of £54.95. Rumour has it that it is selling fast, so if you fancy a bottle then don't hang around - click here to buy. The popular blended whisky has broken the world record for the largest bottle of whisky. 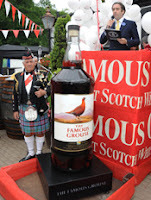 The 228 litre bottle of The Famous Grouse was filled in front of Guinness World Record adjudicator Jack Brockbank and an assembled crowd of VIPs and fans at The Famous Grouse Experience on 12 August. The Experience is located at the Glenturret distillery in the Highlands and has been celebrating its 10th anniversary this year. The record beats that previously held by Jack Daniels of 184 litres. The Famous Grouse record breaking bottle holds a staggering 9,120 pub measures of whisky and took three hours to fill. The hand blown bottle (pictured, above) was made by Czech glass manufacturer Bomma and stands an impressive 1.75 metres tall. The bottle will stay at the distillery and be on permanent display to those visiting The Famous Grouse Experience. The award winning Speyside distillery of Benriach (pronounced ben-ree-ack) has teamed up with The Whisky Shop, the UK's largest whisky retail chain, to release an exclusive bottling. This 17 years old whisky has been crafted from just four single casks, which were all filled on the 4th May 1995. The four were married together exclusively for the chain. Each cask was transferred to virgin American oak casks (ie - fresh oak casks which have not previously held whisky) for a short 'finishing' time before this marrying. In a unique twist, the final whisky was chosen by a selected group of The Whisky Shop's customers in the form of a panel of W Club members (the W Club is The Whisky Shop's own private members club for customers). To join or for details on how to join, visit one of their 21 stores or www.thewclub.co.uk. It has been at the natural cask strength of 53.1% ABV and is retailing in The Whisky Shop's stores or via www.whiskyshop.com for £73.99. 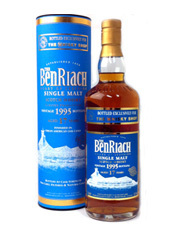 Benriach is a small independently owned distillery which is located in the Speyside region of Scotland, just to the south of the city of Elgin. It was founded in 1897 by John Duff & Co, who built it to help with production at the adjacent Longmorn distillery. They named it (rather unimaginatively) Longmorn 2. The distillery is currently owned by the Benriach Distillery Company, who took control from previous owners Pernod Ricard in 2004. The distillery had been closed for a few years but the company invested heavily and the Benriach single malt brand has since gone from strength to strength, winning countless awards. The annual production capacity is approximately 1.8 million litres. The colour is a vibrant golden yellow and the nose is immediately intense and spicy. There are powerful aromas of vanilla, freshly sawn oak, coconut oil, burnt brown sugar and plenty of wood spices (think of cinnamon bark, nutmeg and cedarwood). Underneath are softer aromas of honey, stewed apple, toffee, toasted almonds and a whiff of spiced orange. It is very oaky and has a bourbon-like quality. On the palate, this whisky is equally as intense as on the nose. The drying wood spices instantly grip the taste buds and hang on - think again of coconut, cinnamon and nutmeg. Other notes start to penetrate and add some sweetness and balance. These include a lovely honey-like characteristic, which is joined by further notes of vanilla, crumbly brown sugar and a hint of tangy spiced orange zest. With time the apple note from the nose can be detected, although now it is more reminiscent of dried apple. The finish is long, intense and drying with plenty of the woody notes and accompanying spices on show. This gives the whisky a mouth watering quality with some creamed coconut, honey and that hint of orange coming through right at the end. With a few drops of water, the whisky instantly feels creamier, softer and rounder in the mouth. The intense spices are dampened and the other notes are allowed to flourish, while maintaining their own intensity. An interesting floral note is also detected - imagine something like honeysuckle. This whisky is very interesting but throws up some challenges. The intensity is clearly driven by the combination of the virgin oak casks and the high alcohol strength. This will mean that it may not be to everyone's taste. However with water it becomes more approachable and has greater balance, as some of the subtle aromas and flavours are allowed to shine. We would recommend adding water and it can take quite a lot, while still maintain its intensity and interest. 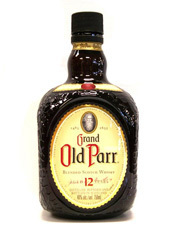 Grand Old Parr, or simple Old Parr as it is sometimes known, is a popular blended whisky brand which is owned by drinks giant Diageo. It forms part of their extensive portfolio of blended whiskies, which currently includes around 80 different brands. The best selling version is this 12 years old, but there are also more limited 15 years old and 18 years old versions. The range is bottled at 43% ABV and this 12 years old should cost around the £40 mark, if you can find it in the UK. A couple of months ago, we reported that the famous Macallan distillery had continued with its tradition of honouring Royal occasions with a special limited edition Diamond Jubilee single malt release. At the time of release, the whisky was only available from the Macallan Visitor Centre at the distillery or via www.themacallan.com. Now some of the remaining bottles are being released to selected whisky retailers in the UK. Macallan is one of the most well known names in the Scotch whisky industry and their single malts have many fans around the world. The distillery was founded in 1824 by Alexander Reid and was originally called the Elchies distillery. It did not become known as Macallan until 1892 and is located in the heart of the Speyside region of Scotland, close to the village of Craigellachie and overlooking the River Spey. Macallan is currently owned by the Edrington Group and is one of the largest distilleries in Scotland with an annual production capacity of eight million litres. 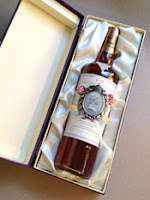 The Diamond Jubilee Edition is bottled at 52% ABV (to commemorate 1952, the year of the Queen's accension to the throne) and there are just 2,012 bottles. It has been produced using a marriage of ex-sherry casks which were hand selected by Macallan's Head Whisky Maker Bob Dalgarno. The whisky is presented in a bespoke purple package, which has been designed by art director David Holmes. It includes a ceramic brooch showing a retro design of the Queen's head, which was designed by Arnold Machin, which was later used on postage stamps by the Royal Mail. Each bottle will cost £350. The colour is a dark golden amber and the nose is packed with rich, sweet aromas - caramel, butterscotch, dark brown sugar, dried fruits (especially raisins, sultanas and candied orange peel), malted cereals, plus whiffs of vanilla and dark chocolate. It is a very promising start and one that makes you want to take a sip. On the palate this immediately feels a bit prickly due to the high(ish) alcohol strength. Once the taste buds get used to that feeling, the 'prickle' subsides and the characteristics begin to reveal themselves in layers. First come some lovely notes of butterscotch, vanilla and chocolate, which are followed by some dark dried fruits (the raisins and sultanas again) and toasted almonds, plus an increasingly prominent note of candied orange peel/zest. As things progress the sweeter notes begin to be taken over by some drier and spicier elements, which create a good balance. These elements include notes of coffee granules, bittersweet cereals and wood spices, like cinnamon and nutmeg. The finish is long, warm and intense with the lovely balance of sweet and spicy notes that combined so well on the palate, particularly the butterscotch, chocolate, cereals and zesty oranges. A dash of water livens up this whisky even more - the 'prickle' of the nose and early palate is dampened and the orange and coffee notes are heightened and come to the fore. This is exceptionally good stuff. The expertise and sympathetic use of the ex-sherry casks are evident and the whisky has a wonderful depth and complexity. It is a whisky that is great taken neat, but it really comes alive when a few drops of water is added. There is a lovely juiciness that develops and this only adds to the complexity. There seems to have been numerous Diamond Jubilee whisky releases in the last few months, but this has to be the best to date. The price tag (£350) is higher than most of the other releases and may put many off purchasing this. However, we would urge anyone that has that sort of money to get a bottle of this, especially if you enjoy your whiskies on the richer and sweeter side. The award winning independent Isle of Arran distillery have appointed their latest 'Ambassador of Arran'. 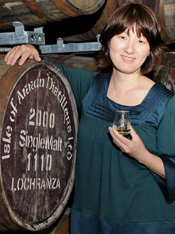 Keiko Manni (pictured, left) from Japan has been appointed to help drive sales of Arran single malts in the country. Manni is the Spirits Buying Leader for Isetan, a prestigious department store in Tokyo, and has helped establish the brand and increase sales significantly during the last five years in Japan. Manni was awarded her 'Ambassador of Arran' title during a recent trip to the distillery. She was accompanied on the trip by Sueko Yamada, a colleague at Isetan. During their visit, they selected a single cask to be sold exclusively in Japan through Isetan. With the help of Arran's Master Distiller James McTaggart and Senior Brand manager Louisa Young, they selected an ex-bourbon cask which was distilled in 2001. 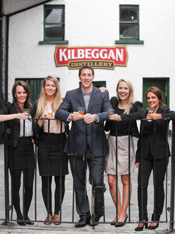 The owners of the multi-award winning Kilbeggan and Cooley Irish whiskey distilleries, Beam Golbal, has hired five Irish graduates to promote its Irish whiskey brands in the USA. The graduates - Emily Duffy from Limerick, Joanne Ryan from Waterford and Ruth Dunne, Michael Egan and Jennifer Graham (all from Dublin) - will each be based in one of five US cities - Boston, Chicago, New York, Philadelphia and San Francisco. The graduates have been immersed in all aspects of Irish whiskey during a training session at the Kilbeggan distillery and tutored on how to market Irish whiskey to an overseas audience. They will work with the Kilbeggan distilling team on every aspect of whiskey production from distillation to maturation and received a whiskey master class from Beam’s Irish Whiskey Global Brand Ambassador John Cashman. The popular Chivas Regal blended whisky brand has announced a new annual collaboration programme and details of the first participant. 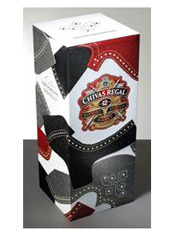 The scheme will see the Chivas Regal 12 years old expression presented in uniquely designed packaging by a series of modern craftsmen. The first edition is called Made For Gentlemen and has been designed by leading footwear designer Tim Little, the Creative Director and owner of iconic luxury British shoe brand Grenson. Little's packaging features a deconstruction of the pattern pieces of leather needed to make a classic brogue style of shoe and will be available to buy from selected retailers from the beginning of September. The Chivas Regal 12 years old Made For Gentlemen will retail for a special price of £25.39. For further information, visit the Chivas UK Facebook page. A couple of weeks ago we reported in our weekly Inbox feature that the Bowmore distillery had announced the release of two new whiskies in its limited edition series of vintages. 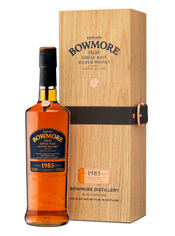 The two were distilled in 1964 and 1985, and both were hand selected by Bowmore's Distillery Manager Eddie MacAffer. Both expressions follow in the footsteps of similar award winning releases and are available globally from specialist whisky retailers. Well, shortly after that a small sample of the 1985 Vintage popped through our letterbox. The whisky has been created by combining an ex-sherry and an ex-bourbon casks, both distilled and casked in 1985. It has also been released at the natural cask strength of 52.3% ABV and is limited to just 727 bottles with a recommended retail price of £300. This release is presented in the regular Bowmore bottle but with an accompanying wooden casket which includes features such as a leather strap with a copper buckle and a certificate signed by Eddie MacAffer. The Bowmore distillery is located on the famous whisky making island of Islay (pronounced eye-la), which lies off the west coast of Scotland. It is the oldest distillery on the island, having been founded in 1779 by John Simpson. This also makes it one of the oldest distilleries in the whole of Scotland. Bowmore is currently owned by Morrison Bowmore, who have been in control since 1963. They are a subsidiary of the larger Suntory drinks company from Japan, who acquired Morrison Bowmore in 1989. The core range of Bowmore single malts is extensive and the annual production capacity of the distillery is two million litres. The colour is a vibrant golden yellow and the nose exhibits some very promising initial aromas. There is a wonderful combination of sweet vanilla, icing sugar and honey, delicate fresh fruits (think of pear, apple and a hint of peach) and soft peat smoke (imagine dry dusty earth and grass). With time a distinct aroma of parma violet sweets comes through, as does a hint of coal tar soap and salty brine. On the palate, this whisky feels superb and mouth coating. It feels opulent and has a vibrant edge. The fresh fruit notes from the nose are immediately evident, especially the green pear and apple ones. These combine well with some notes of soft brown sugar, sweet runny honey and plenty of vanilla, which particularly enhances the soft creamy feeling on the palate. The distinctive note of parma violet sweets is there and again increases with time - this particular note is a characteristic almost unique to Bowmore whiskies above a certain age. The soft, earthy peat smoke is the last thing to reveal itself and has a pleasant hint of bitterness to it. There is also the tiniest hint of salty tang right at the end. The smokiness may appear towards the end of the palate but it is during the finish that it really comes alive, outlasting nearly everything else. The sweeter and the fruity elements lead the way, but as they fade the smokiness shines through wonderfully and extends the drinking experience beyond expectations. The Bowmore 1985 Vintage is an excellent whisky and one that maintains the award winning high standards of the previous releases in this series. The 1980s were clearly a good decade at Bowmore! The nose is gorgeous and highly perfumed, the palate delivers what the nose builds up and more, while the finish is deliciously long with the smokiness coming to the fore. It is a whisky that reminds us why Bowmore is one of our favourite distilleries. We would say that it is worth every penny of £300 for a bottle of whisky of this undoubted quality ... now we just have to start saving up! Blair Athol is a distillery in the central Highlands of Scotland. It is located in the town of Pitlochry and is one of the oldest Scottish distilleries that remain in operation - it was founded in 1798 by John Stewart and Robert Robertson. The distillery was originally named Aldour after the nearby River Allt-Dour (this translates as 'river of the otter' from Gaelic), before becoming known as Blair Athol in 1825 after an agreement between the then owners and the local Duke of Atholl. Blair Athol is located next to Blair Castle, which is home to the current 11th Duke of Atholl and is the most visited private residence in the UK. Interestingly, the Duke has his own army called the Atholl Highlanders and they are the last remaining private army in Europe. The distillery is regarded as 'the spiritual home' of the Bell's blended whisky, which is one of the UK's top sellers. The whisky produced their has been an important component of the blend since 1933 when Arthur Bell & Sons took over. This fact is reflected at the distillery which is home to the Bell's Visitor Centre and opened in 1987. The current owners are Diageo and they continue to use Blair Athol whisky heavily in the Bell's blend. The current production capacity is 2.5 million litres per year and as a result of demand for blending, only one single malt is consistently released - this 12 years old. This whisky forms part of a larger range called Flora & Fauna, which showcases some of Diageo's lesser known or closed distilleries, and all are released in relatively small quantities each year. 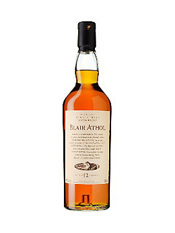 This Blair Athol 12 years old is bottled at 43% ABV and should cost around the £40 mark from specialist retailers. The colour is golden yellow with a hint of amber and the nose is rich with two obvious initial aromas - orange and malty cereals. The orange aroma has a zesty edge, while the malty cereal grains hint at a bittersweet character. Other aromas come through to offer some much needed sweetness, especially some lovely vanilla, honey, caramel and soft dried fruits (think of sultanas, raisins and apple). There is also a pinch of cinnamon-like spice in there too. On the palate this feels rich and viscous, and has a slightly oily feeling. The zesty orange note (think more spiced orange now) and bittersweet malty cereals dominate again initially, perhaps even more so than on the nose. Both notes contribute to a mouth watering feeling as the whisky grips the taste buds. Underneath are further sweeter flavours which come through to balance this zesty, bittersweet edge. These notes include the rich caramel, honey and soft dried fruits from the nose, plus some further fruitiness which has a stewed element to it - imagine stewed apples and pears with a good dose of cinnamon and nutmeg. The finish is almost the reverse of the nose and palate experiences - it begins sweetly with the dried fruit and caramel prominent, before the spiced zesty orange and malty cereal notes return with a vengeance to give a pleasant dryness towards the end. This drying quality is heightened by further cinnamon and nutmeg spice, plus a hint of dusty earthiness. We always enjoy sampling whiskies from distilleries that we have never had, or rarely had, anything from. In the past, we have only ever tried a couple of independent bottlings. It is always good to try the distillery bottling, as this is essentially what the people that make it think that it should taste like. The Blair Athol is an interesting single malt, although one which is not particularly complex. The prominent bittersweet orange and cereal notes were enjoyable to us, but may not be to everyone's taste. As with anything, it is always worth trying something new and we can now tick another distillery off our ever dwindling list of distilleries that we have not tasted. The world's best selling Irish whiskey brand has announced the launch of a limited edition bottle that will be exclusive to the travel retail sector. Named the Jameson Great Urban Escape, the bottle features iconography from seven of the world's most exciting cities including Dublin (the home of Jameson), London, New York, Paris and Stockholm. 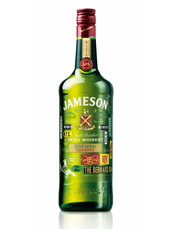 Within this are featured bars in each city where Jameson is the 'whiskey of choice'. To support the launch, a city guide app has been created to provide travellers with an 'insider guide on what to see and do' in four of the cities. To access this app and the information within it, simply scan the QR code below. For those without access to smartphone technology, a traditional printed city guide will also be available alongside the bottles on their display. The bottle is available now from key international hubs across the Americas, Europe, the Gulf states and Pacific regions. The famous Speyside distillery of Macallan is celebrating reaching the 100,000 fan mark on Facebook. To commemorate the achievement they have recorded a short video featuring distillery workers saying 'thank you' to the Facebook fans. The video is below - if you want to 'like' Macallan on Facebook and join the 100,000 others (including us), then go to www.facebook.com/themacallan. Elsewhere, Macallan have also announced the appointment of a new Global Marketing Manager. Jaume Ferràs Santín joins from Bacardi Spain and boasts over 16 years experience in the spirits industry, including a previous stint with the Edrington Group who own Macallan. He will be responsible for developing the overall positioning of Macallan, working with partners from around the world, and driving the creative development of the brand. A couple of days ago, we received a press release from Diageo saying that one of their whiskies had won a major prize at the International Wine & Spirits Competition, one of the industry's most prestigious awards ceremonies. The whisky in question was The Singleton of Glen Ord 15 years old and the prize was 'The Trophy', which is awarded to the best whisky that is 15 years old or less. Normally, we don't pay much attention to such PR releases, as there are now so many whisky competitions and awards that it is difficult to keep track, but this one struck a chord with us. The reason being that we recently purchased a bottle of this very whisky. Another reason is that last week I met up with Maureen Robinson at a Diageo event - she is one of Diageo's Master Blenders and the woman responsible for creating The Singleton of Glen Ord 15 years old a couple of years ago. The Singleton name covers a range of whiskies which highlight some of the lesser known single malts in Diageo's portfolio of 28 distilleries. There are currently three featured distilleries - Dufftown, Glendullan and Glen Ord - and each one is pitched in to a different consumer market. The Singleton of Dufftown 12 years old is available in the UK (it is also available in the travel retail sector, along with 15 and 18 years old expressions), the Singleton of Glendullan 12 years old is exclusive to the USA and the Singleton of Glen Ord is available as 12, 15 and 18 year old expressions in south east Asia. The Glen Ord distillery was founded in 1838 by Thomas Mackenzie. It was originally named simply Ord, before becoming Glenoran in 1882. It became know as Glen Ord in 1923, when it was sold to the famous blending company John Dewar & Sons. Glen Ord is currently owned by Diageo and is fairly large with an annual production capacity of five million litres. Much of the whisky produced at Glen Ord is used for blending with a small percentage being released as single malt. This means that it is little known to a wider whisky audience in most parts of the world, with the exception of south east Asia and Japan which is its stronghold. It was for this reason amongst others that Diageo decided to bottle The Singleton of Glen Ord series for that region of the world. When proposing the launch of this 15 years old expression, Maureen Robinson went out to south east Asia with numerous samples and sat down with selected consumer groups to determine the flavour profile and characteristics of the final whisky. It has been bottled at 40% ABV and we paid around £40-45 for a one litre bottle in Kuala Lumpur airport. The colour is a bright golden amber and the nose shows some early clean, sweet and tangy aromas - think of sultanas, raisins, honey, brown sugar and bitter orange. Underneath is a distinct aroma of bittersweet malty cereal grains and an increasingly prominent note of sugar syrup. There is a hint of cinnamon and nutmeg spice in the background. The combination is very appealing. On the palate , this whisky feels soft, velvety and rich but with a tangy edge that is never far away. This tangy quality is again reminiscent of bitter orange/ candied orange peel. This is complimented by a delicious sweetness which is led by notes of honey, vanilla, brown sugar and dark dried fruits (especially sultanas and raisins). Further complexity is added by some robust malty cereal notes, which grip the taste buds and don't let go easily. In the background are some subtle wood spice characteristics (think of the cinnamon and nutmeg from the nose again) and a faint hint of peat smoke. This smoke feels slightly earthy and has the feel of cigar smoke about it. The finish is lovely and of decent length, with the elements fading slowly. First to go is the tangy orange note, then the sweeter honey, vanilla and fruit. This leaves the robust malty cereals, woody spices and that merest hint of smoke to battle it out to the end. The Singleton of Glen Ord 15 years old is a lovely whisky and one that has plenty of character and interest for the drinker, but without being too complicated. The nose smells very sweet but these notes are balanced by others which stop it becoming too sweet and cloying. There is a clear yet sympathetic use of ex-sherry casks here, which when combined with some ex-bourbon casks have created an easy drinking single malt. We are glad that we have picked up a bottle on our travels and would urge anyone to do the same if travelling in south east Asia. It seems a shame that a whisky of this quality should be restricted to one market in the world, but that is how many whisky companies operate these days. What this whisky does show is that there are some very good whiskies coming out of the lesser known Scottish distilleries and Glen Ord is one of those 'hidden gems'. Last week, we launched a competition in conjunction with The Famous Grouse Experience. The prize was a case (that's 6x70cl bottles) of Glenturret 10 years old single malt whisky. The award winning Famous Grouse Experience is housed at the Glenturret distillery in the Highlands and the competition was part of the Experience's 10th anniversary celebrations which have been going on all Summer. We decided to get you working for the prize, worth £180, and set the question of 'What is your best whisky related experience in the last 10 years?'. We received some great answers and the final decision, which was taken between ourselves and a representative of The Famous Grouse Experience, was a difficult one. However, one answer was the unanimous vote and that belonged to Steve Prentice from Taunton in Somerset. My wife and I got married a few years back, and decided to go to Scotland for our honeymoon. During the second week, we ventured up to Drumnadrochit/Loch Ness to stay in a cabin with marvellous views out over a forest. At this point I must tell you that I'd only ever drunk whisky out of my dad's drinks cabinet, and hated the stuff... I'm from the South West, strictly cider and ale only country! Near the end of the holiday we went into the local village looking for a good meal and somewhere warm to relax for the night. We (luckily as it turns out) stumbled upon the Fiddler's Malt Whisky Bar. What an emporium! I was totally out of my depth and in awe of all the old looking bottles around the place, but I didn't have a clue what was what. We sat down and had a beautiful venison meal with some great local ales... but at the end of the meal I noticed various people taking whisky tastings. With my interest aroused a little I decided that while in Scotland, what better time or place could there be than to try whisky properly. I asked them to go gentle on me and to select three well priced bottles to give me an idea of what I'd been missing. They talked me through trying their selections neat, and then adding a drop or two of water... it was a revelation! I left with a big smile on my face. We went back the next night and did it all again, except this time I spent far too much money and came out with an even bigger smile on my face. I was already well and truly a 'peat head', although I hadn't quite realised it by then. On the long drive for home we stopped in Pitlochry, and on finding a great whisky shop there ended up taking 3-4 bottles home back to the West Country... and I've never looked back! "Thanks to the guys at WFE and the Famous Grouse Experience for such a great competition and prize! I'm chuffed to bits to win and to get to try a single malt that's new to me!" Thanks again to everyone who took the time to write to us and enter - M&K. 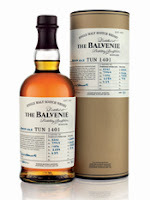 This whisky is the latest to be released in Balvenie's highly acclaimed Tun 1401 series. The series has won prizes and many plaudits across the globe and Batch #5 was released at the end of June. This follows Batch #1 from 2010, Batch #2 from mid-2011, Batch #3 from late-2011 which was an exclusive for the USA market and Batch #4 which was released recently as a travel retail exclusive. Each batch has been created by the legendary Balvenie Malt Master David Stewart. The Balvenie distillery is located in the town of Dufftown, which is in the famous Speyside whisky region of Scotland. It was founded in 1892 by William Grant and is the sister distillery to Glenfiddich, which it is built next to. Balvenie remains owned by William Grant & Sons today and has a current annual production capacity of 5.6 million litres. It is regarded as one of the most traditional distilleries in Scotland, as all stages of the whisky making process happen on site in one form or another - this includes growing barley, malting, mashing, fermentation, distillation, coopering and maturation. The fifth batch of the Tun 1401 has been crafted from nine of the rarest casks that have been maturing at the distillery – four ex-sherry butts distilled in 1970, 1971, 1972, 1975 and five ex-American oak casks from 1966, 1972, 1973, 1974 and 1991. After selection, David Stewart then mixed these individual casks together in a vessel called a tun. This is a large barrel/cask, traditionally made of oak, where different whiskies are allowed to 'marry together' for some time. In this case, he chose to use the finest tun at Balvenie for this marrying process - Tun Number 1401 - and the marrying process took approximately three months. As with the previous releases, the Tun 1401 Batch #5 has a limited number of bottles available (we were not able to find the total amount, but only 700 are being released for the UK market). It has been bottled at the natural cask strength of 50.1% ABV and the recommended retail price is around the £160-165 mark. The colour is a dark golden amber and the nose is instantly rich, fragrant and expressive. The immediate aromas are of milk chocolate and spiced orange. Other aromas include plenty of wood spices (imagine cedarwood, nutmeg and cinnamon bark), dark dried fruits (prunes, dates, figs and raisins), vanilla, butterscotch, honey, black coffee and a hint of peach/apricot and earthy ginger. It is a great smelling whisky. On the palate this is rich, fruity and packs a little bit of a surprising punch. There are plenty of initial wood spice and warming citrus notes that penetrate the taste buds and grip hard - think of cinnamon bark, nutmeg and zesty, dried lemons and oranges. It makes the mouth water and as the saliva mixes, the whisky becomes more velvety and softer. The spices soften but the zesty orange is exaggerated and becomes almost marmalade-like. These notes combine superbly with others to create a palate of extreme depth, complexity and enjoyment - imagine honey, butterscotch, dried fruits (raisins and prunes especially), bitter dark chocolate, burnt caramel, toasted caramelised nuts and hints of demerara sugar and coffee. The finish is long and uplifting with the elements mentioned carry through impressively, particularly the orange, dried fruits, burnt caramel and spices. The spices seem to come back with a vengeance right at the end and give a warming, slightly tannic dryness to the finish. This whisky is well balanced as it is presented, but the strength makes you think to add water. After a few drops the dried fruitiness of the nose is highlighted with the intense wood spices knocked back a little. The palate still packs plenty of intensity in with the orange note still prominent, along with the burnt caramel and chocolate. A hint of peach also comes through very well. The result is equally as good as without water. This is easy - this whisky is very impressive and an absolute cracker. The balance, depth, complexity and intensity is superb and shows David Stewart's incredible knowledge of selecting and then marrying casks to compliment each other in this way. The whisky is equally as expressive either with or without water and is truly outstanding. David Stewart is celebrating his 50th anniversary with William Grant & Sons this year and has chosen a great way to commemorate that acheivement - to release of a whisky of this sublime quality. The Bowmore distillery - the oldest on Islay - has announced the release of two new whiskies in its limited edition series of vintages. The two were distilled in 1964 and 1985, and both have been hand selected by Bowmore's Distillery Manager Eddie MacAffer. Both expressions follow in the footsteps of similar award winning releases and are available globally from specialist whisky retailers. The 1964 (pictured, above) has been matured for nearly half a century in a combination of predominantly ex-bourbon American oak casks and finished in an ex-Fino sherry cask. This stunning whisky is released at the natural cask strength of 42.9% ABV and is limited to just 72 bottles. The recommended retail price is £8,000. The bottle is a specially designed creation by renowned Scottish glass artists Brodie Nairn and Nichola Burns, each of which has been hand blown. The finishing touches, including habd engraving and a bespoke silver neck collar and stopper, have been applied by leading Edinburgh jewellers Hamilton & Inches. The 1985 has been created from a combination of ex-sherry and ex-bourbon casks. This has also been released at the natural cask strength of 52.3% ABV and is limited to 727 bottles, each of which has a recommended retail price of £300. This release is presented in the regular Bowmore bottle but with an accompanying wooden casket which includes features such as a leather strap with a copper buckle and a certificate signed by Eddie MacAffer. The north Highland distillery of Dalmore released its premium Constellation Collection - a series of 21single cask whiskies spanning four decades - to much fanfare earlier in the year. Now the first full set, carrying a price tag of £158,000, has been sold to a USA based whisky investor. Atlanta based property entrepreneur Mahesh Patel (pictured with his set, above) has purchased set number 13, as it is his lucky number. 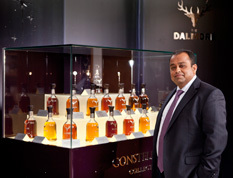 Patel has an extensive private whisky collection totalling over 3,000 bottles and rumoured to carry a value of $2 million USD. The set was purchased through The Whisky Shop, the UK's largest whisky retail chain and current exclusive retailer for The Constellation Collection. The award winning Highland Park is set to make its fans a permanent part of its distillery on the isle of Orkney through the creation of a new, innovative piece of artwork. The Highland Park ‘mosaic’ is a collection of faces crafted into an image capturing a striking views of the island. 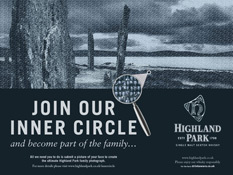 Highland Park is giving its Inner Circle members, the free to join members club of Highland Park, a unique chance to be immortalised on the walls of the distillery itself. All that members have to do is upload a picture of themselves to the mosaic and in return they will become part of the distillery's rich history, by joining our living artwork. Photographs can be submitted in three ways - by downloading the Highland Park App from iTunes; on their Facebook page or via www.highlandpark.co.uk (you can also sign up as a member of the Inner Circle on this website). The innovative Monkey Shoulder whisky brand have announced a series of one-off UK events for the late Summer/early Autumn. The events will be held under the banner of For One Night Only and will involve transforming anumber of disused and derelict urban spaces around London. 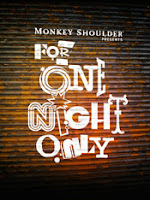 Each event, which will be held once a week (mostly on Fridays) for three months, will be themed around classic cocktails for which Monkey Shoulder is being used as the star ingredient. Each unique For One Night Only event will be part art installation, part bar and part adventure playground for whisky fans. The events will run throughout September, October and November, providing topical serves to celebrate everything from London Fashion Week to Halloween and Bonfire Night. The experience will take place every Friday night in two sessions - the first is from 6pm to 8pm with the second from 9pm to 11pm. Tickets cost £20 per person. 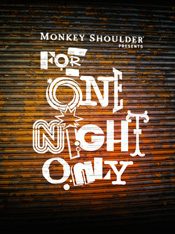 To buy tickets and for further information about the theme of each night, then please pay a visit to - www.monkeyshoulder.com/foronenightonly. The headline says it all - we are currently running a competition in conjunction with The Famous Grouse Experience, which is celebrating its 10th anniversary this year. The Experience, which is based at the Glenturret distillery in the Highlands, are offering a case (6x70cl bottles) of their signature single malt whisky - the Glenturret 10 years old. As we reported in our Inbox bulletin of 27th July, Johnnie Walker the famous blended whisky brand have launched a limited edition cask strength version of their Blue Label expression. Named Blue Label 'The Casks Edition', this new whisky has been blended from a small selection of their finest casks that were hand picked by Johnnie Walker's Master Blender Jim Beveridge. He comments, “Only one in ten thousand of our casks have sufficient character for Blue Label and in creating this special edition we really wanted to showcase the incredible flavours that come from the casks themselves”. 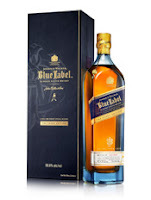 The Johnnie Walker brand is owned by drinks giant Diageo, and is named after Johnnie Walker, a man who owned a small grocery shop in the Ayrshire town of Kilmarnock in Scotland in the 1820s. Back then, nearly all whisky sold commercially was a blend. Having first learnt to blend different teas together, Johnnie Walker used his skills to create a commercially successful whisky blend and the rest is history, as they say. In the early days his whisky was made with local clients in mind and was sold in small quantities. The success of the brand really took off during Victorian times when it was exported around the British Empire. As the Empire expanded, more people enjoyed the range and brand has never looked back. This is shown in the fact that Johnnie Walker whiskies were already exported to 120 countries before Coca Cola had left America in the 1920s. First launched in 1991, no age is stated on the Blue Label but the youngest whisky included is rumoured to be around the 28 years old mark, with some of the whisky coming from rare or closed distilleries such as Brora. The blend contains over 20 rare single malts and superior grain whiskies. The colour is a deep coppery gold. On the nose vanilla, butterscotch, light brown sugar and deep citrus notes (making me think of candied oranges). There is plenty of oak too and a little smoke in the background. The overall impression is intense yet mellow. All the aromas can be found on the palate, which displays the power and delivery of a cask strength whisky (55.8% ABV in this case). In addition to vanilla, butterscotch and orange citrus there is a biscuity flavour carrying with it a trace of something savoury, slightly earthy. The oak spices and grains make a marked early impression, staying the course and carrying a fine grained quality. The texture of this whisky also makes it pleasant to hold in the mouth, as you feel the oak spices develop and bittersweet orange flavours combine on the finish. It is a rare treat to enjoy such an iconic whisky as Blue Label at its natural bottled strength. The whisky is quite mouth cleansing and if you find it a little too astringent then our recommendation is to try a measure with a dash of water. We found this calms the oak and spices whilst still leaving plenty of ‘grip’ to the whisky. Overall it makes for a rounder and slightly sweeter drinking experience. With a recommended retail price of $300 USD for a one litre bottle this also looks to be good value when compared to the standard Blue Label release which is bottled at 40% ABV and retails for approximately $180-190 USD/£140-150. We are delighted to bring you our latest competition in conjunction with The Famous Grouse Experience, the pioneering whisky visitor centre, which is located at The Glenturret distillery. Glenturret was established in 1775 and is the oldest working distillery in Scotland. The Experience is celebrating its 10th anniversary this year and in the decade since opening it has been visited by almost one million whisky fans. To celebrate the 10th anniversary, a number of special events and competitions have been launched at The Famous Grouse Experience. These include an exclusive scratch card competition which offers visitors to the Experience the chance to win a cask of The Glenturret Single Malt whisky worth £7,000, that will then be laid down for 10 years to mature. For further details – visit www.thefamousgrouse.com. Our competition extends the celebrations to those who may not be able to get to The Famous Grouse Experience this year. They are offering one lucky reader of Whisky For Everyone the opportunity to win a case of The Glenturret 10 years old Single Malt Whisky. What is your best whisky related experience during the last 10 years? Your answer could be about a tour you’ve taken around The Famous Grouse Experience or another distillery, the moment that got you interested in whisky, a person in the industry that you may have met or anything relating to your enjoyment of whisky. Your answer should be emailed to us at whiskyforeveryone@gmail.com and the closing date for entries is 9pm BST on Sunday 5 August 2012. Good luck and we look forward to reading your replies. You must be aged 18 years or above to take part. You must be resident in the UK. Only one entry per email address will be accepted in to the prize draw. The closing date for the survey is 21:00 BST on Sunday 5 August 2012. Any entries after this time will not be considered. The winners will be drawn and notified shortly after the closing time. At this point, the winner will be required to give a postal address for delivery of the whisky. If the winner is not above 18 years of age or not a UK resident, then an alternative winner will be drawn. The decision will be made between Whisky For Everyone and a representative for The Famous Grouse Experience. The decision is final, once drawn. 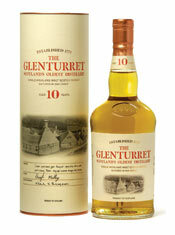 The winner will receive a case (6x70cl bottles) of Glenturret 10 years old Single Malt Whisky. No cash alternative will be offered as a prize. By entering, you are allowing Whisky For Everyone to publish your winning answer. Any personal information supplied is for the sole purpose of the prize draw.